0 Comments Published by KL Ocs Kid on Friday, July 27, 2007 at 11:22 AM. Liverpool have been given permission to play new signings Fernando Torres and Ryan Babel in the Asia Trophy final against Portsmouth. Torres and Babel missed Tuesday's win over South China because they did not have the international clearance. 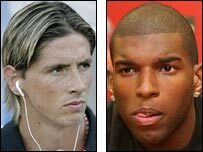 But record signing Torres and Dutch forward Babel will now be available for selection for Friday's game. Liverpool will also be able to call upon skipper Steven Gerrard, who has recovered from a stomach problem. The triple absences on Tuesday disappointed thousands of fans at Hong Kong Stadium and forced Benitez to field a makeshift line-up which toiled to a 3-1 win against the local minnows. "We had some problems without Torres and Babel," said manager Rafael Benitez. "Now we have new options and fresh legs, and maybe we can manage the final in a different way. "Portsmouth will be very difficult to play against but at least we will have more options."